West of Alamogordo, a vast area of desert and mountain ranges 100 by 40 miles in extent is closed to public access and used by the military for various kinds of weapons testing; this includes the Trinity Site where the first atomic bomb was detonated, in July 1945. Determined tourists may visit on two days each year, the first Saturdays of April and October, when accompanied tours are provided. 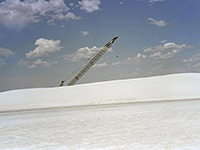 The only other feature of interest in this otherwise desolate and unwelcoming land is 60 miles south in the flat Tularosa Basin, where for thousands of years the prevailing westerly winds have deposited gypsum powder - formerly eroded from the nearby San Andres Mountains, washed down by rainwater and deposited in the seasonal Lake Lucero, a few miles southwest - creating a huge area of white dunes covering 275 square miles. 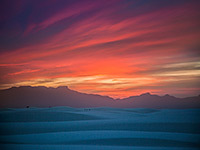 About half of the sands are within the boundaries of the White Sands National Monument, one of the most unusual and magical places in the Southwest. The national monument is entirely surrounded by the White Sands Missile Range; just east is the Holloman Air Force Base, and a few miles north is one of the space shuttle landing sites. The space theme is reflected in the nearby town of Alamogordo, home to the International Space Hall of Fame and the Space Theater. The dunes extend north into the missile range for another 12 miles. 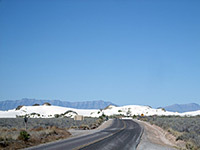 The main road past White Sands National Monument is US 70; this (and the dunes) is closed to all traffic for a few hours once or twice a week as test missiles are fired overhead. A paved road (the Dunes Drive) leads from the visitor center at the monument entrance on US 70 to the start of the sands 2 miles north. The edge dunes are just a few feet high and support some plant life, with several species of grass, yucca and saltbush managing to survive at scattered points, but further into the monument there is little or no vegetation, just an unbroken white landscape. The road is paved for a while although blowing sand often covers the surface; towards the center though, the surface is just compacted gypsum, and the 'road' becomes a series of large cleared areas, which can be adapted to changes in dune position, as the sands move by up to 20 feet per year. 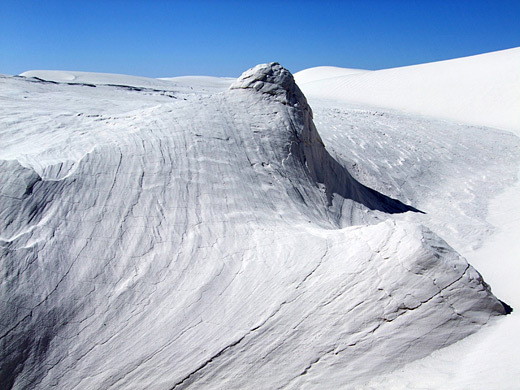 In this surreal environment, everything is white, dazzlingly bright and intensely hot in summer, capped on most days by a clear blue sky. 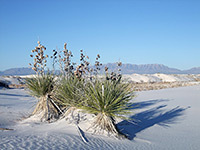 White Sands National Monument has three short nature trails and one longer hiking path, although cross-country walking is allowed anywhere within the sands, up to 106° 20' longitude, west of which permits are required. The 0.15 mile Playa Trail leads to a small dry lake bed that occasionally fills with shallow water after recent rains. On the opposite side of the road, the Dune Life Trail loops for one mile around an area just inside the southeast edge of the dunes, and has notices about how plants and animals have adapted to life in this sandy environment. Further along the road, the Interdune Boardwalk is a 0.2 mile raised walkway across flat land between two lines of dunes, ending at a nice viewpoint. The Alkali Flat Trail is rather more challenging - a 4.6 mile loop, much of which is across soft, shifting sands, to the start of a vast flat area beyond the northwest edge of the dunes. Despite these varied paths, however, and the striking scenery, many people visit the monument just for recreation - picnicking, sunbathing and sand sledding are the main activities. There are no camping facilities in the national monument apart from ten primitive sites in the dunes, well away from the main road. The closest accommodation is in Alamogordo, 15 miles northeast, while the nearest free camping is in the Lincoln National Forest, 5 miles further east along US 82. A good public campground is available 26 miles away at Oliver Lee State Park in the foothills of the Santiago Mountains, reached by US 54 south of Alamogordo. 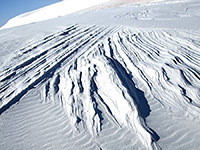 The gypsum dunes support a limited range of wildlife, some of which has evolved white coloration to match the surroundings, and exist as species unique to this region, such as the white sands wood rat, the Apache pocket mouse, the white sands prairie lizard and the bleached earless lizard. The most prominent plant in the dunes is the soaptree yucca, a species with numerous thin narrow leaves and an extensive root system that can stabilize a mound of sand and remain in place after wind causes the surrounding dune to more away. Walking through the dunes is an unforgettable experience; often there are no other footprints ahead, just wind-created ripples and occasional lizard tracks. 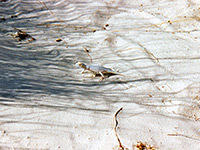 When daylight begins to fade after a sunny day, the sands take on a reddish-pink hue, and the surface patterns become more pronounced as the shadows lengthen. An overwhelming sense of peace and stillness descends, and when the sun finally dips below the distant San Andres Mountains, for a few minutes the land is bathed in a mysterious light, as the sands themselves seem to glow while the horizon on all sides becomes dark. If experience is a guide, though, this magical moment is difficult to photograph effectively. The nearest hotel to the national monument (14 miles away) is Holiday Inn Express Hotel & Suites Alamogordo - a beautiful, relatively new property just east of the junction of highways US 70 and US 54. The inn offers 80 rooms & suites on 3 floors, and has all the expected facilities including an indoor pool/whirlpool, health & fitness center, business center, meeting room, guest laundry and free breakfast bar, but it earns a reputation as the best hotel in Alamogordo on account of the quiet location, friendly staff, reasonable rates and excellent standard of cleanliness. Other nearby hotels: Alamogordo, Las Cruces - follow the links for descriptions, reservations and location maps.